This day was spent exploring three nice little areas that we had not seen before. We always look to hike trails we have not done and we found a nice collection of short ones today. 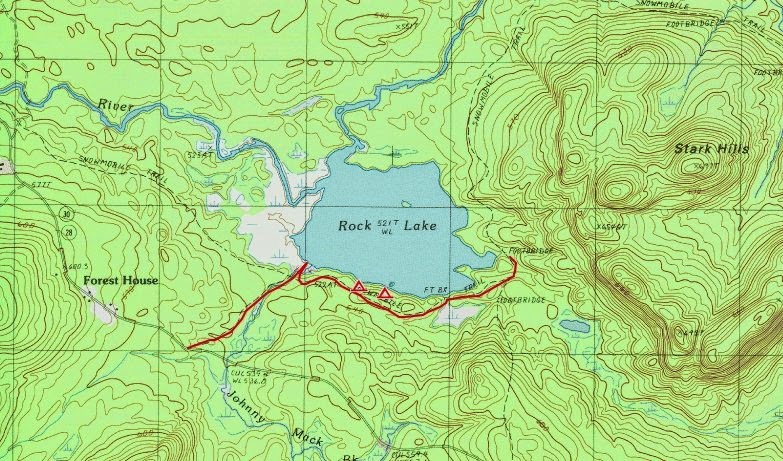 We started with a trail to Rock Lake, just east of the hamlet of Blue Mountain Lake. There is a .5 mile trail that leads to the lake. Just south of the lake is a snowmobile trail that runs east-west which made it easy to continue our hike by going eastward along the south shore. There are two designated campsites close to the waters edge on the south side of the lake. They were nice and provide easy lakes edge camping with a short walk of less than one mile. We continued east until we met the north-south trail at the east end of the lake. We could have continued on this trail but chose to return in order to head to our primary destination of the day. This was a nice short hike to a very pretty body of water. It would be a great place to camp and boat with a family that wanted a quiet location and east getaway. Back at the car, we headed for Blue Mountain Lake to climb to Castle Rock, a rock ledge vantage point just north of the lake. To reach the trail, you turn on Maple Lodge Road just south of the Adirondack Museum. You follow the road until the designated trailhead parking, just before the Minnowbrook Conference Center. This hike can be done as a loop and we chose to do it that way. We went clockwise, which brings you to the more interesting part of the hike first, and it gives you a nice look at the cliffs south of Castle Rock on the way up. This hike would be a fantastic hike for a family and kids of all ages would like the talus caves at the south base of the mountain and the open rock ledge and view at the top. There is also fun rock scrambling available for the kids. 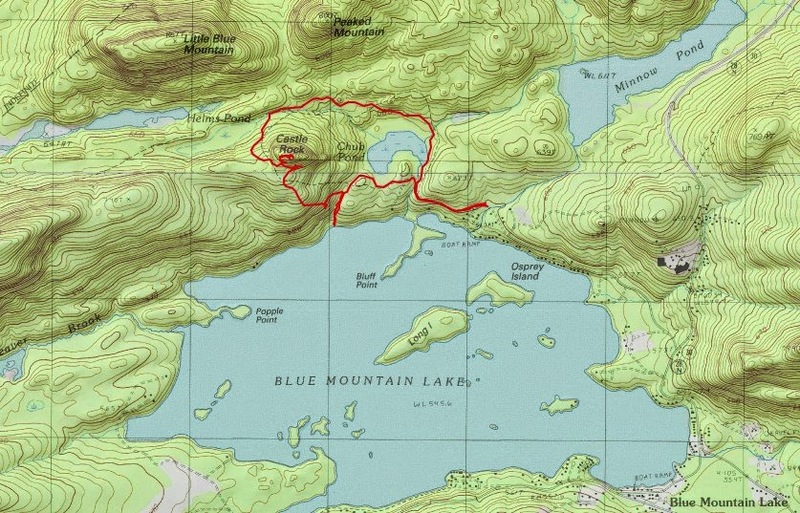 On the way in, way took the short .3 mile spur trail that led south to the north shore of Blue Mountain Lake. Halfway there, we passed the stone remains of a structure located in a small drainage creek. It had something to do with water, but we were not sure what. Anybody know what is was used for? Once back at the main trail, we began to climb towards the southern base of Castle Rock. On the way, we took a short herd path on the left which lead to an early viewpoint of Blue Mountain Lake. 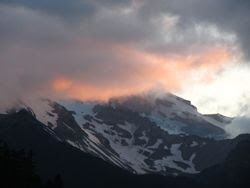 Continuing on, we reached the base of Castle Rock and were enticed by the talus caves that were visible from the trail. They were interesting as well as safe to climb through. Kids would love them. We forged ahead and were soon at the summit rock. The views were fantastic, but it had become partly cloudy by this point. I want to come back to this location during the peak of leaf season. It reminded me of Mount Frederica, overlooking Lake Lila. The wind chill on the summit was much colder than if was down below, so we didn't break for lunch on the top. Leaving the summit, we continued our clockwise loop by heading around the north side of the mountain. Eventually we came to the trail junction with the trail leading to Upper Sargent Pond. This trail looks like it would be a nice XC ski trail, but I think it is used by snowmobiles.